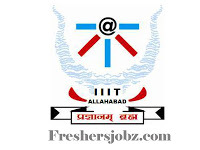 IIT Allahabad Notification 2018.Indian Institute of Information Technology Allahabad has released a notification for the recruitment of Administrative and Technical Cadre vacancies.Check the eligiblity and notification prior to apply for the positions. Qualifications: Diploma/ Degree (Engg), Bachelor Degree, B.E/ B.Tech/ MCA/ M.Sc. with relevant experience. Selection process: Based on Written Test, Computer Test and Skill Test. Date of online Application: 23.10.2018 to 09.11.2018.